We hope everything about Angel Jewellery will please you, and to make absolutely sure you feel happy and confident with your purchase, I am always on hand to discuss any queries you might have. Just contact me here. If by chance you are not happy with your Angel Jewellery and would like to return it, exchange it for something else or request a refund, please find our policies below. If you are indecisive about your angel it’s okay, you are allowed to change our mind. Firstly, please contact us here and we will do all we can to help you with your next move. Items returned must be in perfect condition, unworn and exactly as received, in original packaging. Items must have been purchased online, from this website. Please register the returning parcel and email us, including your name, address, the postal service used and the tracking number of the parcel. Please let us know the reason you are returning it. And finally, we are happy to process your refund/exchange within 30 days at the very latest, subject to the above terms & conditions. 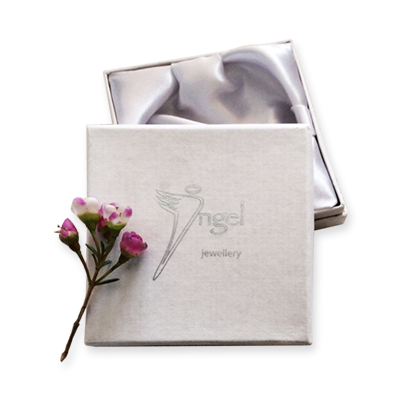 Our Angel Jewellery is made to last and rarely breaks, but should you experience a breakage with normal wear, please contact us with the details and we will help all we can, and let you know what to do next. If you purchased your angel necklace less than 1 year ago the cost of repair is on us. If more than a year has gone by since it’s purchase, a fee will be charged depending on the extent of the repair needed. In either case please contact me here so we can advise you on the return and repair of your Angel Jewellery.